Stylish looks and very desirable. 435i is an amazing engine with thunderous performance. Superb handling. Rides better than coupe. Roof only works up to 8mph. Style, quality and desirability. If that's what you're looking for in a convertible then there's plenty of choice from the premium manufacturers. So what makes the BMW 4 Series stand out? Well unlike alternatives from Audi and Mercedes-Benz, the 4 Series stands out by virtue of its metal folding roof. It means the BMW is more secure when parked and quieter on the move. It may add some weight, but the benefits more than make up for it. Being a BMW it handles immensely well with great agility, helped by the rear-wheel drive set-up. There are also xDrive four-wheel drive models, but only on top versions. What is impressive is the ride quality. It's actually better than the 4 Series Coupe, making the convertible very comfortable, even if you go for an M Sport model. If you want affordable running costs then the 420d is the one to go for. It has decent performance but will prove usefully economical with around 46mpg in real world driving. Yet the best engine is the 435d. True, it's not cheap with a list price of more than £50k, but it's effortless fast and sounds good too, with huge reserves of torque. And if you're not covering big miles there's the 420i. It may the entry-level engine in the range but it's still enjoyable to drive and smooth too. The six-cylinder 440i is the top of the range petrol, akthough despite the badge, it's actually a 3.0-litre engine, albeit with power boosted to more than 320PS. The 4 Series Convertible is more expensive than the 3 Series it replaces but then it does come with more standard equipment. This includes plenty of kit such as round parking sensors, heated and electric front seats, xenon headlights, DAB radio and Dakota leather upholstery. With its sleek design and metal folding roof, the 4 Series Convertible is incredibly desirable. It also comes with some of BMW's best engines and handles superbly well, as you'd expect of a BMW. It even rides well. Add in lots of standard kit and it's easy to see why we rate it so highly. 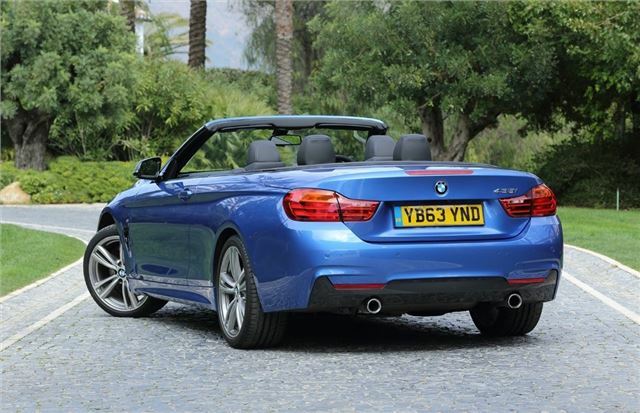 The competition may be very good but we find it hard to look past the 4 Series if you want a quality convertible. A good quality hard top convertible car with a lot of extras as standard. A real joy to drop the steel roof and tear off into the Welsh hills close to my home !